Could you be wrong about LinkedIn? Now this guy is a contract business analyst in a fairly specialised area of banking and finance systems. So he’s a business owner. He needs to find and keep clients. His clients are banking and finance professionals. Where are his target clients most likely to be active in a professional capacity on social media? OK so he has a contract now. In fact, he’s had contracts pretty much continuously for the last few years. He’s got them through recruitment agencies and contacts. So he doesn’t really need LinkedIn, right? Recruitment agents move around – a lot. Contacts move jobs more and more frequently. Both have LinkedIn profiles that stay with them. My contractor colleague has two lead sources – agencies and contacts – and he’s not really doing a good job of keeping in touch with either. How many lead sources do you have in your business? I know of one successful online business owner who generated ALL his business from Facebook ads. That was until Facebook changed its rules and overnight his business died. He effectively needed to start again. That’s why every business needs multiple lead sources. So you can probably see the reason why my contractor colleague should be actively using LinkedIn. But why should you use it in your business? Why should LinkedIn be a key part of your business to business marketing strategy? Yes it does get used as an online cv. Which means everyone puts there job titles and descriptions on there. Which means you can easily search for and find your ideal target clients. Yes, it gets used a lot for that too. But the chances are your best clients are on LinkedIn. So who do you think they are connected to? Old colleagues in trhe same or similar lines of business. They could be your next best clients. And you already know someone who can introduce you. I just get spammed by people selling me stuff. Spam and sales messages are a fact of life. But they are much less prevalent on LinkedIn because to message someone you are not connected to requires an InMail which has to be paid for. Spammers don’t like paying for anything much. 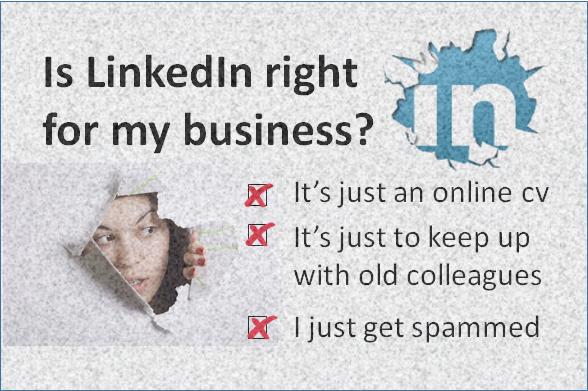 So these three reasons that business owners don’t use LinkedIn are the very reasons they should. Their ideal clients are there, easily found and available to be contacted. Could they be wrong about LinkedIn? So let’s get sending those sales letters right? LinkedIn is online networking for professionals. You wouldn’t turn up at a networking meeting and start asking people to buy your stuff would you? So don’t do that on LinkedIn. All the rules about social selling apply. Build rapport, give value and ask questions. And make sure your profile sings your praises and proves your credibility. If you want to find out more about how to use LinkedIn to make your business more successful join me for one of my free webinars. Click here to sign up. Is luck a factor in success when it comes to business? Somehow I just struggle to believe that it is. If you look at successful people, whether from the world of sport or business, it’s the preparation that gets them into a position to take opportunities. In both these quotes it’s the hard work that generates the opportunity. Jefferson and Player weren’t successful just because they worked or practiced hard. There are plenty of hard working people that are not super successful. Yes they had the application to hone their business and sporting skills. But they also had the right mindset or attitude. One that was open to possibilities and opportunities. Something that can influence your attitude is who you hang around with. Yet another quote – “You’re the average of the five people you spend most of your time with.” Jim Rohn. Successful entrepreneurs tend to hang around with other successful entrepreneurs. They spark off each other. They learn from each other. And it can rub off. Observe how they operate. How they spot and then take opportunities. The bottom line is that who you hang around with matters. 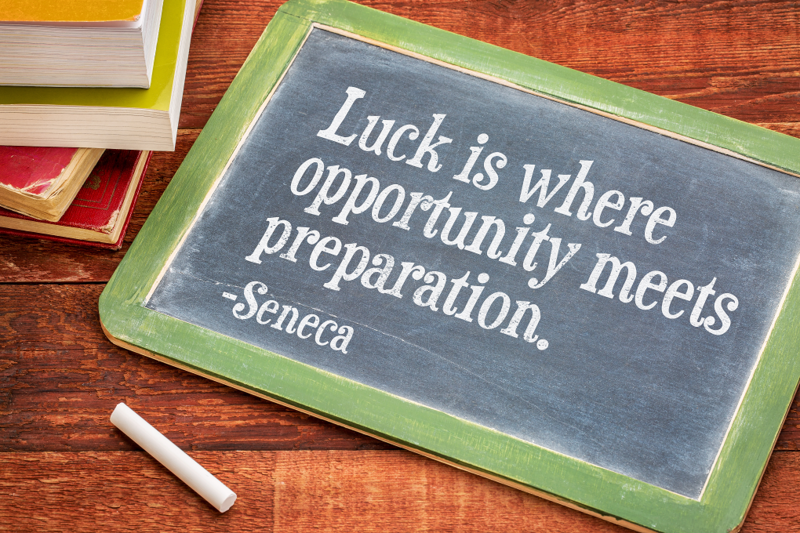 So can you make your own luck in your business? Hone your business skills and set your business up for success. Network with other smart entrepreneurs and learn from them. I often hear stories of people that see something successful, but because it’s in a different line of business or other area unrelated to their business that close their mind to how it might work for them. It’s a bit like the “I know….” attitude I talked about a few weeks back. 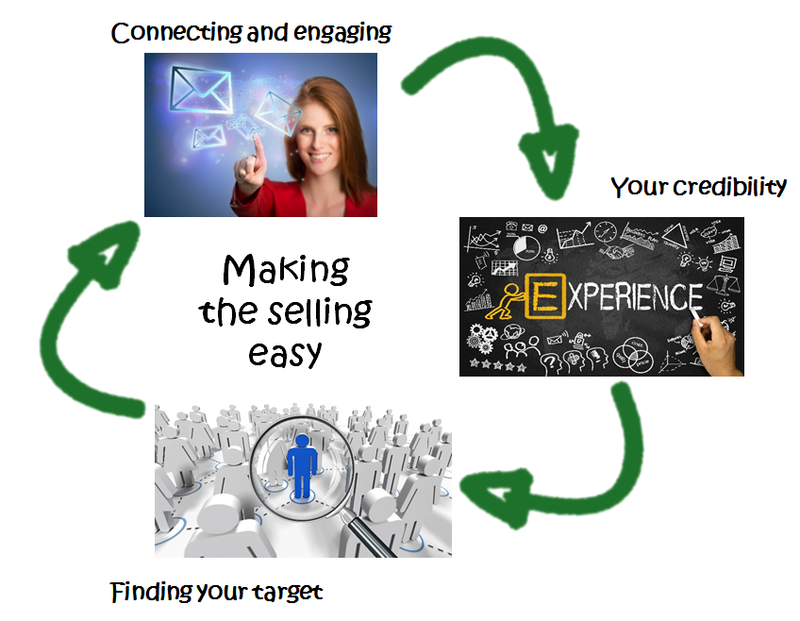 I even talked a bit about this last week in my blog post “Making the selling easy“. That was about working hard to make the right connections. It was about being open to the possibilities that those connections might throw up. That’s how I ‘got lucky’ with two LinkedIn connections generating five and half years consulting revenue. PS If you’d like to learn how to use LinkedIn to generate your own luck there’s still time to sign up for my next Online Bootcamp now. Just click the link. Here’s the secret to me getting 5½ years consulting work…. Yes, just two connections on LinkedIn have kept me in consulting work for 5½ years. The first role arose when a connection reached out to a number of her connections looking for people with just my sort of skills. A quick e-mail and less than 48 hours later I was signed up as an associate to a consultancy that kept me at the same client for 4½ years. The second role came about when a former colleague and LinkedIn connection saw one of my blog posts through LinkedIn and asked if I might be interested in a role one of her connections needed to fill. A few conversations later and I was signed up for 6 months in Oslo. I then got poached back by the first client because I built such a good working relationship with them. That’s another 6 months and counting…..
Firstly they think LinkedIn is just an online cv used by people to get new jobs and recruiters to find candidates. But with over half the world’s professionals on LinkedIn, with job titles and descriptions, it means your ideal prospects are almost certainly on there and are easy to find. The second objection I get is that LinkedIn is just to keep in touch with old colleagues. Yes it gets used for that a lot too. But if your best clients are on LinkedIn who do you think they are connected to? That’s right, old colleagues in a similar line of business. The final objection goes along these lines “I’m on LinkedIn but never get any business from it and just get spammed by sales people”. Well if you treat LinkedIn like a cv or an old boys network, that’s all you’re likely to get. You can make the selling easy for your business too. Get yourself an awesome personal profile. One that delivers real value to the reader and builds your credibility from the off. Taking these three steps in the right way means your prospects will see the value you give to your clients without you having to sell. They’ll be coming to you asking for your help. If you want to have LinkedIn make your selling easy, sign up for my Online Bootcamp now. I’ve always felt that success should be based on hard work, ingenuity and ability. I came from a working class background and earned the right to go to university and haven’t looked back since. In my corporate days I saw quite a few examples of people getting on because of who they knew and not what they knew or did. There’s a saying – “it’s not what you know, it’s who you know”. Frankly, it left a bad taste in my mouth. Now I’m a business owner and I’m finding a new twist on that old saying – and it’s a good twist. You see, I’m what I would describe as a “connected business owner”. That doesn’t mean I tap in to some “old boys’ network” to get preferential treatment in winning contracts or anything like that. No, it means I’m connected to my clients, to my suppliers, to the communities I operate in and to my peers. Connecting is at the core of my business strategy. It’s not just what I know, it’s also who I know. Client connections – Without a sale there is no client. And the easiest sale is the one that solves a client’s problem or takes away an immediate pain. But if you don’t understand the problem or the pain, how can you take it away. If you connect with your clients and get to know them you will understand their problems, their pains, their desires. Then you will be better placed to serve them and meet their needs. Connecting and understanding makes the selling easy and makes for happy clients. Happy clients are really important because they tell their friends and connections. They offer up referrals and recommendations of your products and services. They also tend to be repeat buyers – after all, why would they go elsewhere? 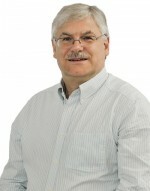 Supplier connections – Many business start out as one-man bands. But as you grow and become successful, that success will be limited by your ability to handle everything. What’s more, you’re probably not best skilled to do everything. Yes, you can save a few pounds by doing your own bookkeeping, but is that the best way to be spending your time? Couldn’t you use those hours more productively finding or servicing more clients. If new clients are worth less than the cost of a bookkeeper, you’re in the wrong business and you should take up bookkeeping. So you need to develop a network of trusted suppliers. People to whom you can hand off all the things that stop you developing and growing your business. That doesn’t have to mean racking up huge overheads with maintenance and support contracts. It means getting to know the right people that can provide the support you need, at a price you can afford, when you need it. Where do you find such suppliers? That’s from the next group of connections. The wrong networking: It can be a lonely life running a business, especially in the early days on your own. Sat in your home office with a laptop and a phone it’s easy to become detached and disheartened. So you go to network meetings. Many business owners hate networking and only do it because they know or have been told they should. They hook up with similar minded people and networking becomes an excuse for a chat and a coffee. No real business is done. No productive connections made. The right networking: Smart business owners remember the Jim Rohn quote “You are the average of the five people you spend the most time with”. So they make sure they spend their networking time with other smart business owners. People they can learn from. Such groups attract good suppliers (who are business owners themselves) because the suppliers know they will have a ready market of smart business owners that want to outsource all the tasks that distract them from growing and developing their businesses. These networking groups are also about encouragement and accountability. I was at the 100th meeting celebration of one such group recently. One of the long standing members said a few words about why he liked the group. He started his marketing business on his own in an office with an old laptop and a phone. When he first joined the group he told them of the bold plans he was committed to and the group encouraged him and regularly asked how he was getting on. That encouragement and accountability drove him to succeed. Less than two years on he employs eight people and has a six figure turnover. Unless you only need a small number of clients and suppliers and have a small close-knit group of network connections, it just isn’t possible to stay in touch with everyone face to face all the time – you’d never get any business done if you tried. 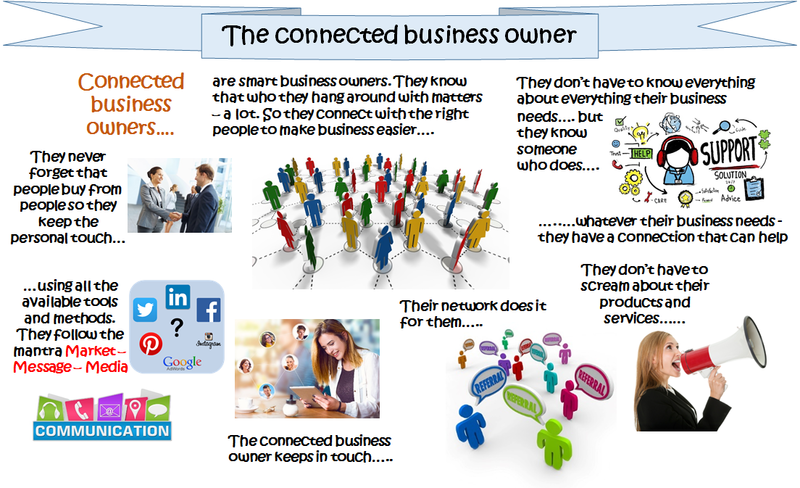 So how does the smart business owner stay connected? They use all the modern media capabilities at their disposal. If you are in a B2B business – selling to other businesses – then LinkedIn should be at the core of your connection strategy. Even if you are B2C, it should be at the heart of connecting to suppliers and your business network. Why? Because LinkedIn is the professional social media site. Over half the world’s professional have a LinkedIn profile – some 380m worldwide and 18+m in the UK alone. If you have a LinkedIn profile, the chances are that most of the people you need to connect to – clients, suppliers and other entrepreneurs – will have one too. With LinkedIn’s fantastic search capabilities, those connections are easy to find. And if your profile sings the praises of you and your business, and your existing clients echo that through recommendations on the site, the opportunities for you to connect and engage with more ideal clients are unlimited, provided you do it in the right way. If you want your LinkedIn profile to sing your praises and start connecting with your ideal prospects in the right way, sign up for my next online LinkedIn bootcamp. Click the link for more details.